It’s fair to say that sleep paralysis is a pretty common theme in the horror genre, explored in everything from films like Invasion of the Body Snatchers and Nightmare on Elm Street, to the recent series adaption of The Haunting of Hill House on Netflix. As a human experience, it’s fairly common too, a fact that no doubt plays a factor in its popularity as a narrative device. It combines one of our earliest and most primal fears with a powerful sensation of helplessness so effective that even with a scientific explanation for the phenomenon, we often still assign one that is spiritual. It’s as if night terrors are so scary that we can’t accept they might be harmless. We need to believe that something is there. The recent interactive novel (Don’t) Open Your Eyes is a chilling reminder of what sleep paralysis feels like. Taking place entirely from the perspective of a person who has just gone to bed, the game somehow conveys, in its simple dialogue structure and minimalist presentation, such a familiar and sickening sense of dread. As you drift off to sleep, the contrast of the room’s immediate surroundings bleeds through the abyss of your closed eyes, giving shape to the darkness and imbuing it with sinister possibility. From the unknown emerges a featureless entity, a lonely figure existing in the plane between life and death, drifting from shadow to shadow in search of someone to talk to. 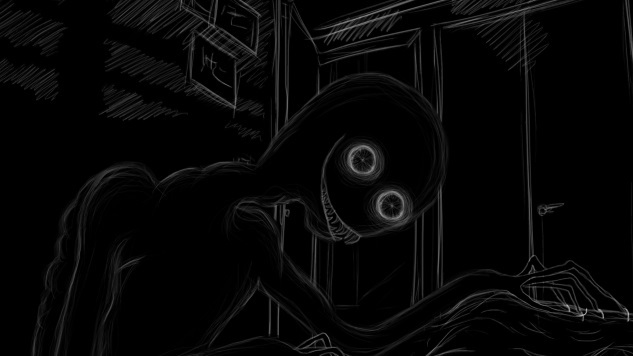 As they speak, a mostly one-sided conversation ensues, and they have but one request of the player, the siren’s call of sleep paralysis: you have to open your eyes. The only way they can achieve peace and combat their deep loneliness is if someone looks at their face and tells them what they look like. But doing that of course means doing the one thing you fear the most. It’s a delicious tug of war between paranoia and pity; the longer you wait, the longer your strange guest will stay, but despite their promise that “nothing is really there,” you just can’t trust or believe. The last thing you want to do is open your eyes. And yet, it’s the only thing you want to do, too. The game has several branching paths of dialogue, and all of them are delivered in a low whisper. If you’re not particularly ASMR sensitive, you’ll probably blast through them, but if you’re one of the many folks who are, oh boy, is this the game for you. There are a total of 27 different endings depending on how you respond in conversation, so there’s lots of replay opportunity to get the most out of the experience, and potentially hours of spine-tingling gameplay. But also, don’t let that distract you. This is one impressively effective recreation of what it’s like to wake up afraid of the dark, and just as scary, if not scarier, than any combat-focused horror game. Check it out now over at Itch.io.